Network Rail workers last Friday announced their plans to strike from 5pm on bank holiday Monday, in a row over pay. Should it go ahead, it will be the first UK-wide rail strike for 20 years. It follows a vote for action from RMT union members but has been condemned by Transport Secretary Patrick McLoughlin. There are strong suggestions the new Conservative government will look to tighten the laws on strikes, with specific reference to the numbers responding to ballots. This would be especially true for essential public services. But what will the effect be on Network Rail’s reputation among the public? In January I covered the impact Christmas delays and cancellations had on its ailing brand perception. And now, another major story has hit the headlines. Since news of the industrial action emerged, we have once again see various YouGov BrandIndex metric scores decrease. 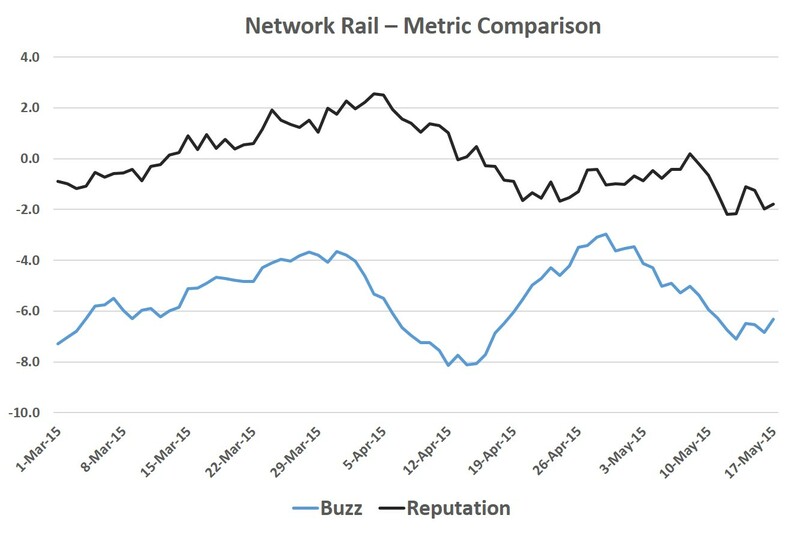 YouGov’s Buzz Metric has decreased from around the -4.0% mark in mid-April, to a low of -7.0% following the announcement, indicating respondents had heard negative news surround the organisation. Their reputation metric has also decreased to a low point of -2.0 following the announcement. This underlines that companies can be tainted by taking such a radical approach to workers pay structures. In January, we asked our panel about whether workers in a series of professions should have the right to strike. Respondents thought police officers, armed forces members and doctors should not have this right. In the case of railway and underground workers, 65% said they should be able to strike, against 27% that said they shouldn’t. But with potentially nationwide disruption on the horizon, will the public be so forgiving? Of course there is still time for all parties to compromised and call off the action. The new government may see this as their first major test of the new parliament, and with history of disputes with the unions characterising some past leaders’ eras, there will be pressure from within its own ranks to ensure there is no repeat of those bad days.